Gary will be joined on stage by special guests Dr Aseem Malhotra, Dr Andreas Eenfeldt, Dr Campbell Murdoch, Dr Zoë Harcombe, Dr David Unwin, Dr Malcolm Kendrick and Ivor Cummins. For the past half a century, the concept of a healthy diet has been synonymous with a diet low in fat, and particularly low in what is all-too-often referred to as “artery-clogging” saturated fat, the fat found in quantity in eggs, butter, meat and dairy products. The result has been a national dietary prescription to eat ever more plant-based diets: copious fruits, green vegetables and whole grains ,while we minimize our consumption of animal products. For those of us who are overweight or obese, this advice has been accompanied by the insistence that we got that way merely by eating “too much” and that the only way to solve our problems is to eat less and exercise more. And yet this now ubiquitous dietary advice has coincided with unprecedented increases in the prevalence of obesity and diabetes, raising the obvious question of whether this advice and the belief system associated with it may somehow be to blame. Are they based on sound science? And if they’re not, which the evidence strongly suggests, then how did we come to believe them and why? And, perhaps most important, what’s the alternative? Why do we get fat and diabetic, and what can we do about it? Taubes’s skeptical, rigorously scientific approach to nutrition science is unparalleled and now he wants to share both the approach and the implications to our health and how to eat to remain healthy. Even if you can't make it to the live event, rest assured there will be video available to Subscribing Members of Re-Find Health. Join today and get access to this video as well as every other video that we produce in the future. How to think about medical research and the paper-of-the-day phenomenon: what we know and what we can know. Understanding obesity: why we get fat from a biological perspective: what to do about it. Note: Although this full-day seminar is geared toward the general public, practitioners and students will also find it both informative and entertaining. Nutrition and personalized medicine: is there one “healthy” diet for everyone? What do we know and what’s speculation? Note: Although this full-day seminar is geared toward healthcare professionals and students, all who wish to attend are welcome. Dr Malcolm Kendrick Malcolm graduated from medical school in Aberdeen and trained as a General Practitioner. He now lives and works in Cheshire in general practice, Intermediate Care, and Out of Hours. He has a long term interest in the epidemiology of cardiovascular disease, and has published article in journals such as Medical Hypotheses, the BMJ and pharmaco-economics. He set up the educational on-line system for the European Society of Cardiology, working with the European Commission and also set up the first website for the National Institute for Clinical Excellence (NICE) in the UK. He has published widely on many topics. He was elected to Who’s Who in 2009 for his work in the area of cardiovascular medicine, and published the best-selling book The Great Cholesterol Con which was translated into several languages. He lectures widely on a range of medical topics, and is a member of The International Network of Cholesterol Skeptics (THINCS) a group of scientists and researchers who share the belief that cholesterol does not cause cardiovascular disease. He now writes a blog drmalcolmkendrick.org and has recently published his second book Doctoring Data which looks at how data are manipulated and distorted before being presented to the medical profession and public. Dr Campbell Murdoch has a personal goal of optimising the health and wellbeing of individuals and populations. This passion has been born out of working as a GP in the NHS for 15 years in combination with postgraduate studies in sports and exercise medicine, teaching, organisational behaviour, and leadership. He also works within Somerset CCG as Person-Centred Care Lead with a determination to ensure a healthcare system and community focusses on what really matters to people. Through his daily work Campbell became increasingly aware that the complexity of health and wellbeing required a model that assisted practical application. A simple framework called ‘The Human Five’ was born. This model encompasses the Mind, Movement, Nutrition, World and Body in a dynamic and interrelated manner. Ivor Cummins BE(Chem) CEng MIEI PMP® completed a Chemical Engineering degree at UCD in 1990. He has since spent over 25 years in corporate technical leadership and management positions, and was shortlisted in 2015 as one of the top 6 of 500 applicants for "Irish Chartered Engineer of the Year". Ivor's focus and specialty is leading teams in complex problem-solving scenarios. He has often led worldwide teams with over 60-70 engineers working on major technical issues; the largest of these involved product issues where hundreds of millions of dollars were in the balance. 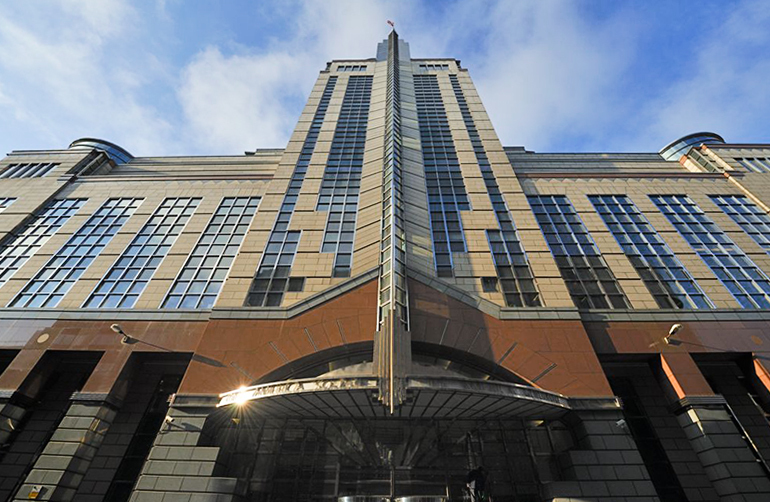 Several years ago, Ivor encountered a complex technical challenge in his personal life. Receiving poor blood test results, he was unable to get solutions via the doctors consulted. He thus embarked on an intense period of biochemical research into the science of human metabolism. Within eight weeks he had resolved and optimized all of his blood test metrics. Also, he had shed over 15Kg of bodyfat with relative ease. In the following years he continued his research on the many "root causes" of modern disease, from "cholesterol" through to insulin resistance. He has become a professional speaker of note, giving many public lectures and chairing interviews with worldwide health experts. Most notably he was invited by the President of the British Association for Cardiovascular Prevention and Rehabilitation (BACPR) to give a keynote talk on heart disease root causes, at their annual conference in London last October. All of Ivor's public lectures and interviews are available on his YouTube channel, where nearly a million views have been recorded to date. Dr Zoë Harcombe (Q&A Moderator) is a Cambridge graduate and author of six books including Why do you overeat? When all you want is to be slim? (2004 & 2013); Stop Counting Calories & Start Losing Weight (2008) and The Obesity Epidemic: What caused it? How can we stop it? (2010). Zoë has a PhD in public health nutrition. Her thesis was entitled “An examination of the randomised controlled trial and epidemiological evidence for the introduction of dietary fat recommendations in 1977 and 1983: A systematic review and meta-analysis.” A number of peer-reviewed articles have emanated from this work [1-9]. Appearing regularly on radio and TV, regionally and nationally, Zoë has had the opportunity to participate in: Sky News; Steve Wright in the Afternoon; Radio 4's The Food Programme; ITV’s Tonight programme; and BBC Newsnight. Further afield, she has been interviewed by America's Fox News and Cape Town radio. Zoë has written for most national UK newspapers and magazines. Zoë passionately believes that current dietary advice is wrong and that populations need to return to eating the real food that we ate before we had epidemics of obesity and diabetes. Apparently this is a controversial proposition! Zoë shares her views at conferences worldwide and in her highly-accessed diet and nutrition blog. During the last seven years Dr Andreas Eenfeldt has authored the biggest health blog in Sweden and a #1 best-selling book on nutrition that’s been translated to eight languages, including English. He may be partly responsible for a recent butter shortage in his home country, and one of his conference presentations on LCHF has been viewed over 600,000 times on YouTube. Dr Eenfeldt spent twelve years working as a doctor and eight of those years as a family physician, treating patients with LCHF diets. During that time he witnessed tremendous success for people with obesity and type 2 diabetes. But despite that, helping one person at a time couldn’t change the status quo. So in 2015 he quit. Now he runs the fast-growing health site DietDoctor.com as the founder and owner, together with 16 co-workers. The site is completely free from ads, product sales or industry sponsorship and instead fully funded by the people, via an optional membership. Dr Eenfeldt lives in Karlstad, Sweden with his significant other and their two young daughters. He spends just about all his waking hours either with his family or working on DietDoctor.com. When he is not working as a doctor in the National Health Service, Aseem Malhotra reigns supreme in his fight to raise awareness about the health benefits of a sugar-free diet, maintaining that sugar deserves its reputation as "Public Health Enemy Number 1". His no-holds-barred approach to challenging common health beliefs is proving highly effective in getting medical professionals and social authorities from around the world to sit up and take notice. He is regularly invited to speak at national and international conferences. Aseem supports studies that implicate sugar as the number one culprit driving obesity, type 2 diabetes and heart disease, and has worked with a leading sports scientist to dispel the myth that links physical inactivity and obesity. The British Journal of Sports Medicine published their editorial providing evidence that sugar and excess carbohydrates were primarily responsible for the global surge in type 2 diabetes and obesity. A subsequent commentary Aseem wrote in the Washington Post had over 1.1 million page views. He has since become one of the leading doctors in the world fighting the obesity epidemic, named on a list of anti-obesity activists that includes Michelle Obama and Michael Bloomberg. Gary Taubes is an investigative science and health journalist and co-founder of the non-profit Nutrition Science Initiative (NuSI.org). He is the author of The Case Against Sugar (2016), Why We Get Fat and What to Do About It (2011) and Good Calories, Bad Calories (2007), published as The Diet Delusion in the UK. Taubes is the recipient of a Robert Wood Johnson Foundation Investigator Award in Health Policy Research, and has won numerous other awards for his journalism. These include the International Health Reporting Award from the Pan American Health Organization and the National Association of Science Writers Science in Society Journalism Award, which he won in 1996, 1999 and 2001. (He is the first print journalist to win this award three times.) Taubes graduated from Harvard College in 1977 with an S.B. degree in applied physics, and received an M.S. degree in engineering from Stanford University (1978) and in journalism from Columbia University (1981). The Case Against Sugar: Among Americans, diabetes is more prevalent today than ever; obesity is at epidemic proportions; nearly 10% of children are thought to have nonalcoholic fatty liver disease. And sugar is at the root of these, and other, critical society-wide, health-related problems. 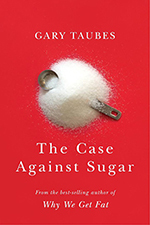 With his signature command of both science and straight talk, Gary Taubes delves into our history with sugar: its uses as a preservative, as an additive in cigarettes, the contemporary overuse of high-fructose corn syrup. He explains what research has shown about our addiction to sweets. He clarifies the arguments against sugar, corrects misconceptions about the relationship between sugar and weight loss; and provides the perspective necessary to make informed decisions about sugar as individuals and as a society. Why We Get Fat: What’s making us fat? And how can we change? 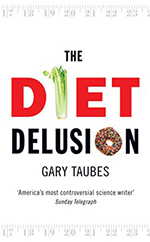 Building upon his critical work in Good Calories, Bad Calories and presenting fresh evidence for his claim, bestselling author Gary Taubes revisits these urgent questions. Taubes reveals the bad nutritional science of the last century—none more damaging or misguided than the “calories-in, calories-out” model of why we get fat—and the good science that has been ignored. He also answers the most persistent questions: Why are some people thin and others fat? What roles do exercise and genetics play in our weight? What foods should we eat, and what foods should we avoid? 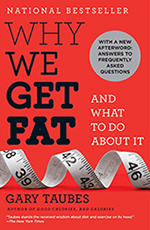 Persuasive, straightforward, and practical, Why We Get Fat is an essential guide to nutrition and weight management.he arguments against sugar, corrects misconceptions about the relationship between sugar and weight loss; and provides the perspective necessary to make informed decisions about sugar as individuals and as a society. The Diet Delusion (Good Calories, Bad Calories in the U.S.): Where mainstream nutritional science has demonised dietary fat for 50 years, hundreds of millions of dollars of research have failed to prove that eating a low-fat diet will help you live longer. Nutrition and obesity scientists have struggled to make sense of the paradox that obesity has become an epidemic, that diabetes rates have soared and the incidence of heart disease has not declined despite the fact that society is more diet and health aware today than generations ago. "The Diet Delusion" is an in-depth, scientific, groundbreaking examination of what actually happens in your body as a result of what you eat, rather than what the diet industry might have you believe happens and is essential reading for anyone trying to decide which diet - low-fat or low-carbohydrate - is truly the healthy diet. For years we have been deluded by the dieting industry. Now it's time to find out the truth. A lucky group of people will have the opportunity to dine with Gary in an informal setting and get to know what makes him tick as well as enjoying the company of likeminded friends — all while enjoying a stunning six course menu. Re-Find Health reserves the right to cancel an event due to low enrollment or other circumstances which would make the event non-viable. If Re-Find Health cancels an event, registrants will be offered a full refund. Refunds will not be available for registrants who choose not to attend an event or simply have had a change of plans. These above policies apply to all events produced by Re-Find Health unless otherwise noted in the corresponding event materials. Please read all individual event information thoroughly.